Drink this Rosé and Lychee. Rules don't go down well at Chateau Jacked. So if you're expecting flowery tasting notes and rigid serving regimes, you've come to the wrong bottle. Share it, serve it, pair it any way you want. If it feels right, try it. This is a mix of delicate rosé and sweet lychee. Tearing up tradition is what we do. This is wine. Jacked. Chateau Jacked less rules. More flavour. Delicate fruity flavours enhanced with exotic lychee notes. Balanced and rounded with a fruity aftertaste. With premium natural flavours, no nonsense language and a unique tearaway label this is wine, Jacked. 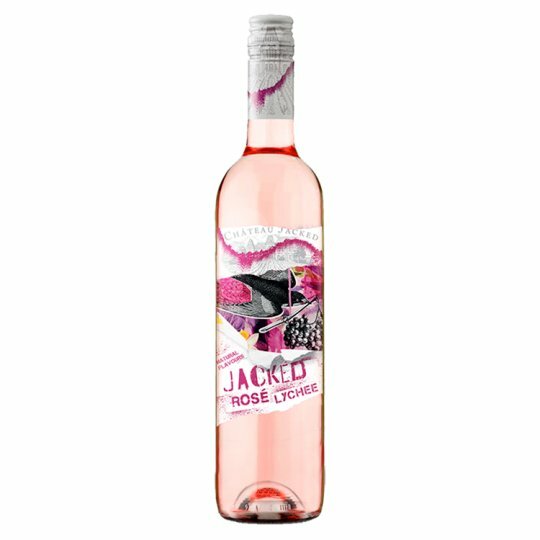 Jacked breaks away from wine convention, tearing up the rules and focuses on flavour and enjoyment. Less Rules, More Flavour. Alluvial and colluvial soil with good permeability. Produce of Chile. Produced in the U.K.